I am just going to come right out and say this: I have a problem. I am addicted to...bags. Computer bags, camera bags, flight bags...if it has a handle or strap and carries stuff, there's a great chance you can find it in my bag graveyard. It seems we all amass a large collection of bags, big ones, small ones, I'll bet you know the drill. As far as my flight bag goes, it was a durable Sporty's bag designed for carrying LOTS of paper charts, back when paper charts were actually carried by pilots. But with my migration to digital charts via Foreflight, I was finding lots of wide-open space not being used in this big bag. So when Paul Lemley wrote and asked if I wanted to "test fly" one of his Classis Flight Bags, I went to this page, looked at a photo of this bag for about :0001 of a second, and said yes. Keep in mind that here at Airplanista, we just do not do many product reviews. Sure, I'm always open to the suggestion, but I have a tough rule about these kinds of reviews...the person sending me the stuff to review needs to understand I am going to be painfully honest. And it might not be pretty. Lemley said that was fine, sent me a bag and said to "give it my best shot," and in a few days, the bag hit my front porch. As I removed the bag from it's plastic shipping wrap, the sensuous smell of fine leather filled my office. There is something about the aroma of virgin leather, it is the scent that accompanies a fine English Dressage saddle. To the touch, this flight bag has a "hand" that makes one immediate think quality. The material is thick and supple, the straps and hardware designed as if they were meant to last for generations. Because they are. I loaded the bag with my essentials, and set it aside for the next flight. 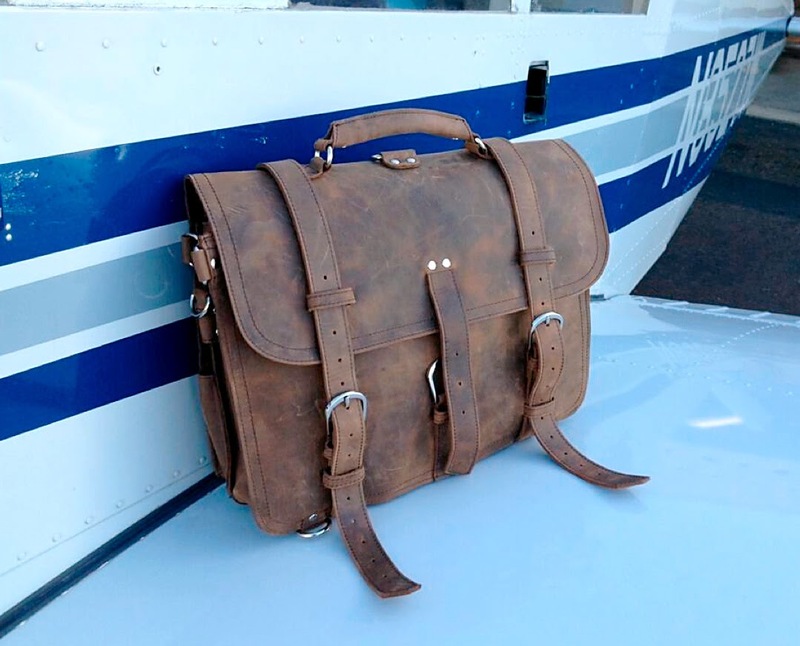 When that came, I threw this gorgeous bag over my shoulder and headed to the hangar. The bag redefines what style means in a flight bag, it just feels good on your shoulder. It might not have a million little pockets for everything you need, but when you step out of your 1964 Cherokee, it will make you look - and maybe feel - like you stepped off a Citation X...or a DC-3. I used the word "timeless" in my headline for this review because this bag looks exactly like something a businessman would be carrying as he stepped off a transcontinental flight in a vintage 1930's airliner. That's not to say it is old, or out of style, no, it carries with it a style that looked good back then, and looks good today. Both the construction and materials used allow me to say with confidence that I will pass this bag to my granddaughter when I croak, and she will pass it to her son or daughter, and on...and on. I full expect this bag to be a weathered, "been there, done that" flight bag 100 years from now. Like exquisite saddles from the old West that are perfectly usable today, this bag will still be carrying pilot stuff for generations. And as far as a review of how it carries my stuff, that is a non-story. While the buckles on the giant straps appeared at first glance to be old school, they become perfectly acceptable after just a few uses. It did take a few flights to fully get comfortable with the straps and buckles, but now I do not even think about them. And all my stuff stays put, and is readily available in flight when the bag is in my back seat, unbuckled and ready for easy access. I would recommend this bag for anyone who wants to kick their ramp style up a notch or two. It looks great, is made of ridiculously high-quality materials, and will get plenty of compliments as you walk into any FBO. I think the $495 price is fair for what you get, and Lemley is offering $50 off right now, plus free shipping. But if you are not happy with the bag, he offers a 100% money back guarantee and even pays the shipping to return the bag, so trying one is a no-lose deal for the buyer. If you want to treat yourself to something unique and very cool, try one of these bags. But if there is a pilot on your holiday shopping list, you will BLOW THEIR MIND when they unwrap this bag on Christmas morning. If that is your plan, better get with the program, because December 7 is the last day to order and get this in time for Christmas morning. For more information: Visit the website, call (414)-534-6723 or email to classicflightbag@gmail.com.